On behalf of the thousands of villagers who benefit from our mission, thank you very, very much for your financial support and your prayers this past month. As the days lengthen, many of them filled with snow and drifting, we offer you our sincerest gratitude for your generous help. With 7,000 souls, it’s Nome’s closest town that large, and it’s the capital of Chukotka (choo-KOTE-kah), which is the Russian province next to Alaska. Victoria accompanied Nome’s mayor and other dignitaries for the inaugura-tion of Roman Abramovich as governor. With wind chill temperatures at -70° and colder, Victoria was none-theless “warmly” received. Please watch for more pictures next month! Talking to your kids about alcohol and drugs; rebellious teen behavior; botulism and other foodborne illnesses; prostate cancer; the dangers of smoking; how to detect poor vision or faulty hearing in your child; promoting literacy; drinking and driving; how to handle an intoxicated guest; anxiety; Arctic survival; carbon monoxide poisoning; and many, many more, on topics such as health, education, history and science. Thank you for helping to make these broadcasts possible! 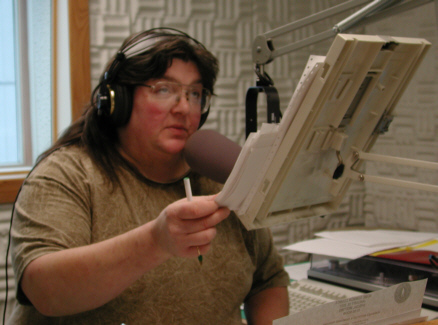 Hurray for LINDA RAAB, who’s in Nome to help out during Paul Korchin’s leave of absence. You’ll recall that Paul’s at Harvard, completing his PhD in ancient Middle Eastern languages. This is the 14th time that Linda has flown to Nome to pitch in at KNOM. INSPIRATIONAL SPOT: INSPIRATIONAL SPOT: I lift up my eyes to the hills…where does my help come from? My help comes from the Lord…the Lord will keep you from all harm…He will watch over your life. top YES, IT’S TRUE: KNOM is the oldest Catholic radio station in the United States, and has won more major awards than almost any radio station anywhere. We work hard to serve our far-flung audience in remote Eskimo and Indian villages, and into Russia. You, however, are our mission’s real strength. It is you who makes our work possible. THE WARM-UP: Nome hasn’t set any daily high-temperature records lately, but overall, the winter has been much warmer than usual. Although temperatures can drop into the -50°’s, a normal Nome January day varies between –3° and +13° F. By comparison, January 28th’s mercury ranged from +21° to +27°. In fact, December 1st through January 31st was the warmest such period ever. The temperature averaged 20.4°, which is a whopping seventeen degrees warmer than normal! We experienced brutal wind, but the wind chill rarely dropped below a relatively balmy -20°. There is lots of snow, however. With plenty of winter to go, alongside the KNOM studio, the permanent winter drift is already about eight feet deep. CLOCK-WISE (left) As Linda Raab continues to smoothly read a news story in Studio A, her eyes quickly dart upward to check the clock. That sleepy-eyed look is in fact intense concentration. KNOM’s local news begins at :55 past every hour, and the news reader must exercise great focus in order to time the end of the newscast to exactly the top of the hour. “OH, GOOD!” That was everyone’s untypical response when we learned that volunteer Mike Nurse had walking pneumonia. We had feared worse, and Mike is doing well, thanks to your prayers. Please consider including missions like KNOM in your will. INSPIRATIONAL SPOT: Love seeks only one thing: the good of the one loved. top ICE TO SEE YOU! 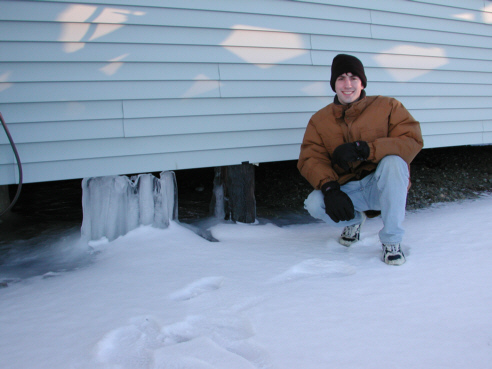 (left) Volunteer Olin Fulmer inspects a stream of ice that formed when a pinhole developed in a water pipe serving the volunteer dormitory. Interestingly, the very same thing happened to the KNOM studio building a few weeks earlier. Plumbing experts think that unusually acidic water from the Nome supply, churned by the buildings’ circulating pumps, repeatedly ate away the copper of both pipes at just one tiny spot. The volunteer dorm’s glacier spread thirty feet to each side; in the photo, most of it is hidden by a light snowfall. There was no serious damage, but all of the feed pipes to the two buildings may have to be replaced next summer, at a cost of several thousand dollars. We've added many photos to our web site this past month, plus a linked index of all Nome Static images since the newsletter went on line in May 1997. You'll also find a page devoted to inspirational spots, a page detailing the early buildings of the KNOM mission, an essay on the grueling tower construction of autumn 1970, and lots, lots more. INSPIRATIONAL SPOT: Only optimists can accomplish anything worthwhile, because only positive people find it worthwhile to accomplish anything. The world’s greatest leaders in all facets of life have been individuals who believed deeply that they can make a difference. And they believed that making a difference matters. top VILLAGE PROFILE: 164 miles west of Nome, Savoonga is located on remote St. Lawrence Island. Although almost everyone in the village is Presbyterian or Seventh Day Adventist, KNOM is immensely popular there. The town is built on wet tundra, with its buildings connected by boardwalks. The island has been home to Alaskan and Siberian Yupik (YOOP-ik) Eskimos for thousands of years; most of the present inhabitants claim ancestry on the Russian side. Because of its isolation, its culture and lifestyle are considerably closer to the old ways than in many other villages. Most residents live off the bounty of the ocean, such as seal, fish, crab and whales, and it has been called the “Walrus Capital of the World.” Other food sources include the abundant sea birds (almost 3,000,000 of them! ), bird eggs, and tundra greens. While there aren’t many jobs, the village is home for some of the finest ivory carvers in the world. Things are looking up in town; while people in 32 of Savoonga’s homes still haul water and honeybuckets, 45 homes have enjoyed indoor plumbing for the past two years. Thank you for helping us to serve the people of this, and many dozens of other villages throughout vast western Alaska! Knowing and showing and daring and caring. Life’s made of losses and crosses and crowns. THIRTY YEARS AGO: Finally, the tower climbing was finished, the 230-foot tower was tuned, the transmitter all wired and calibrated, and on February 18, 1971, Tom warmed up the transmitter and cautiously pressed the LOW POWER ON high voltage pushbutton. The transmitter responded with a flash of light, a crackling sound and a “ker-thunk!” A little detective work determined that one of the 5,000-Watt power tubes was short-circuited, and less than an hour later, a momentary silent carrier signal beamed across the Alaskan airwaves. It worked! Everything pointed to an official sign on by late spring. “Boy, were we wrong,” Tom remembers, shaking his head. We’re hoping for a great gathering for KNOM’s 30th anniversary, July 14, 2001, and we warmly invite you to join us, starting with Mass and a potluck at 10:00 AM July 13th. We expect that former volunteers living in Nome will be have full houses if we’re fortunate to have a crowd, and you may need to make living arrangements with one of Nome’s hotels or bed and breakfasts. If you need assistance or advice, please let us know and we will be happy to help. Once more, THANK YOU for making our mission’s powerful signal possible, 24 hours a day. We pledge our continuing prayers for you and for your intentions. Until next time, may God greatly, greatly bless you for contributing to this greatly needed mission. INSPIRATIONAL SPOT: Can you feel God’s encouragement? Can you sense, in creation or the presence of loved ones, or just in your heart, that your Creator knows you and approves of you? The gratitude we feel in these moments of awareness can be a prayer, and that prayer is life to our souls.